We are sharing with you some notes about our progress in getting Kniterate to you. The different sections reference the timeline we have shared with our backers on our private forum on our website. The new jig has not provided us with the results we expected and the way we were planning to build the machine at a larger scale has proved unreliable. Although it’s not been a successful jig, the work we’ve put on it has been useful in understanding better the forces and stresses the internal structure undergoes during the assembly process. The experience is helping us develop a new jig and rearranging the assembly steps with the goal of achieving the desired tolerances. Based on the timeline, we should be ordering the new jig iteration this week. The new jig has already been designed incorporating what we’ve learned from our previous work and we are currently talking with different suppliers about accuracy, times and costs. Our goal is to try and order it before the week ends, otherwise, we will do it early next week. A new knitting machine iteration is also on track to be ordered next week. This is the area facing the biggest delays. The work involves making aesthetic decisions and thinking about different aspects of user interaction and safety. This is mostly defined, but we are taking the opportunity to make some minor improvements. We are aware that the machine will not be complete without an enclosure, but we consider spending time on this now less critical. For that reason, we have favored working on the mechanical aspects, which are of greater importance for the functionality of the knitting machine. Nevertheless, there has been progress. We are about to order some of the vacuum forming parts this week. We will also have freshly baked samples coming out of the molds we’ve designed in around 20 days. Next week we also aim to finalize and order the design of the sheet metal parts. We are very happy about how the latest iteration of the carriage electronics is working and consider it nearly completed. Only some minor changes will be required. We are now working on improvements of the mainboard and the LCD display board. Writing of the firmware is on track, with the current focus being the development of the onboard menu and debugging the code. These will be completed at a later stage and thus depends entirely on our ability to stay within the timeline. Overall, we are approximately two weeks behind. We’ll aim to catch up to stay within the tasks’ forecasted time. We have great news on this front! We’ve found a Boston-based developer with an interest in textiles who has been working with us part-time. The infrastructure for the app has been set and development of the GUI is in progress. We expect to be sharing an alpha version next month in our private forum. We are very excited to finally be able to share an interface (on its infant steps) with you and to get your feedback! 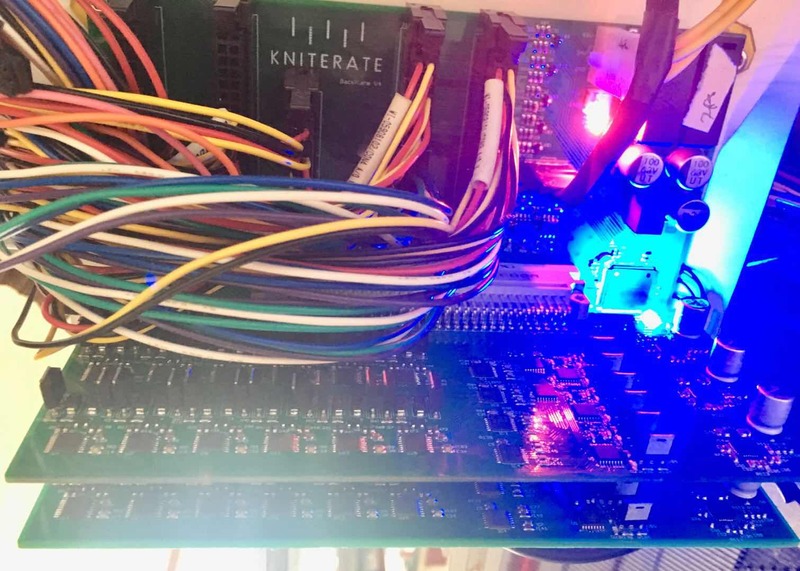 Have you pre-ordered a Kniterate knitting machine and don’t have access to the private forum yet? Get in touch with us by answering this email. We have used 24.65% of the cash we’ve received from you (from 20.5% on our last update). This means 75.25% of all the funds you have given to us are safely deposited. As you can see, despite adding the design and manufacturing consultancy and a software developer to our payroll, we’ve been able to keep our costs under control. At the same time, the additions have helped us make progress at a faster pace, so our outlook remains positive. We will hold off any additional hiring for the foreseeable future and keep our infrastructure simple, as we’ve always done. Here are our prices until July 15, 2018. They are for Batch 4, with pre-orders expected to ship in June 2019 (two Batch 3 units are still available! ).